Editors Note: Since so many SR! readers enjoyed Colleen First's four part adventure series in 2004 about her trip to Alaska and back I had hoped she would do some more adventure touring and share with us. Indeed she has been and here's the first of a four parter about her trip into Mexico during the winter of 2004/2005. Photo: Packed and ready to go. Who knows - that soft luggage may come in handy later? I never had any great illusions that I would do a trip like this, so when I saw the post for it on www.sport-touring.net I wasn't heartbroken that I couldn't go. I had completed a trek to the Arctic Ocean in the summer of 2004 and while Mexico seemed like the next logical direction, I would not be able to join the casual group of riders who were going. I had started a new job just two weeks previously and there was no way I could take the time off to go south. Then my new boss approached me on Wednesday the 15th of December and apologized that, because business was slow to get off the ground, he was going to have to cut my hours for the next month or so. I made a quick decision: why don't I solve both of our problems and just go to Mexico for a month? He seemed very pleased at this prospect, and I was immediately excited about going. I called up James, who would be leaving for San Diego in his truck either that day or early the next morning, and asked if I could join him on his drive down to San Diego. We made some adjustments so that both bikes would fit in the bed of the truck and he gave me some instructions on what paperwork would be required at the border. Then I started to pack. This was at 2pm on Wednesday. By 1pm on Thursday both bikes were loaded, gear stowed, papers were in order and we were heading south. We drove straight through Washington, Oregon and California, reaching the San Diego area Friday afternoon. We enjoyed the beach scene for a while before heading to James' dad's house. There we unloaded the bikes, did some last minute prep work, left the truck in the driveway and anticipated romping around the Mexican countryside. Since we didn't have far to go, we didn't leave for Mexico until almost noon. This let us have a relaxed and enjoyable morning packing the bikes and double-checking last minute items. James was riding his brand new and slightly modified Suzuki DRZ 400 and I had my trusty 2000 Kawasaki KLR 650, which had proven its worth on my journey to the Arctic Ocean earlier in the year. The bikes were soon packed and we were off. It was a brief but pleasant hour's ride to the Tecate border, meandering through some enjoyable rolling hills and cottonwood-shaded canyons on our way. The border crossing wasn't bad, only slightly confusing. We had to fill out paperwork that was essentially a promise that we weren't going to sell our bikes while in Mexico. This required going to the main office for the initial paperwork where we filled out our personal information. From there we were directed across the street to the bank where we paid our small fees and had the paperwork stamped. We were told to make copies of our stamped forms and head back across the street and up the block to the Banjercito. But after making copies and on our way to the Banjercito the initial gentleman who gave us the original paperwork hailed us. He gave the originals a second stamp and then sent us on our way to the Banjercito. After an interminable wait in line there we finally made it to the counter, only to learn that the copies we had made were invalid because they didn't have the second stamp! James took the double stamped originals back to the store to make new copies while I waited in line again. When he returned we were finally able to get everything taken care of and our forms were carefully packed away. We mounted the bikes and resumed our travels. We had chosen a KOA campground for our first night's stay in Mexico, simply because it was nearby and would be easy for the rest of the group to find us when they did show up. What a night! Little did we know that the quaint little KOA campground nestled in the rolling scrub-covered hills harbored such evil: jake-braking semis drove past us all night, at all hours, coming and going. They were so loud that I actually thought a Cessna had buzzed us. It wasn't the most peaceful night's sleep, and it wasn't very warm, but it was still exciting: our first night in Mexico! Photo: This would be considered one of the better sections of off-road sections to come. The rest of the crew arrived around 1pm as James and I were packing up the bikes. There were 3 more KLRs and a KTM 950 in the group, which gave us quite a range of bike size and ability. We introduced ourselves, as James and I were the only ones who knew each other previous to this ride. There was some eye rolling as I confessed to the group that I had almost no dirt riding experience and that I'd do my best not to slow them down. 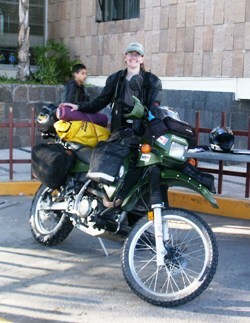 Then the crew got on our bikes and we headed east on Mexico Route 2. Just past the town of El Hongo we made a turn onto a small dirt side road that I wouldn't have given a second thought to otherwise. 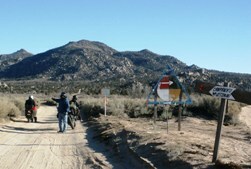 This road took us south into the heart of the wilds of northern Baja. The road became little more than a track through tall brush, consisting of rocks, dirt, sand and road-encompassing puddles. Other than a couple of tame logging roads in the Pacific Northwest, I had never ridden dirt roads, so this was a great 35 miles and it really tested my riding skills. The other riders all had some basis of dirt riding experience, so I did my best to imitate them and learn through their examples and patient explanations. I think that I did pretty well, only dropping the bike once, late in the day and in deep sand. The road twisted and turned and gained in elevation, eventually leading us to Parque Nacional Constitucion where we reached an elevation of 5,300' and were surrounded by tall dry pine trees, tall scrub brush and prickly pear cactus. The first rule for riding in Mexico is Do Not Ride At Night. So what did we do? We rode in the dark through these narrow dirt roads, dodging rocks and puddles and sand, looking for a place to put up our tents in relative comfort and safety. After checking with a local we finally found a field just off the road and made camp there. It was late and there was nothing nearby. We broke out what foodstuffs we had with us and soon bunked down in our individual tents. It was only 4:30, but it was dark and cold. And about to get colder: by the time the full moon rose in the clear sky above us, someone had recorded a temperature of 22 degrees. There was frost on our tents and our water bottles were frozen solid when we crawled out of our sleeping bags in the morning. By the time dawn arrived, we had spent 14 hours nestled away from the cold, lulled to sleep by a chorus of coyotes throughout the night. We left the camp by 9:30 and continued through the park, heading past Laguna Hanson and through some amazing rock formations and more pine covered hills. As we were cautioned to gas up whenever we could find gas, James and I filled up at a small settlement where the proprietor sold gas out of 1-gallon milk jugs and even supplied the funnel to pour it into the tank. He charged us $4 gallon for this privilege. One of the guys was leading and took us on an "unimproved road" which is frightening to think that what we were on might have been considered "improved." We headed up this washed out, rock-strewn stretch of dirt and I dumped my bike not more than 15 minutes later. I could see that it was only going to get worse and made up my mind that I was not going to continue in this direction. The group gathered together, looked at the GPS and local maps and came to a decision to take the "easier" road towards Valle de la Trinidad (and lunch) and then make better time to our next destination: Mike's Sky Ranch. We fueled up and had lunch in Trinidad before heading south on RT 3. We took another obscure turn off that led through some farmlands but soon left them behind as the road gained in elevation and started to twist and turn through the mountains we were entering. The road was mostly rock and dirt, but once it crested the highlands it became sandier and harder to navigate. The sand got really deep (at least 6") and challenging. There were also a few rivers that ran through the area so I was also able to experience my first water crossing. After 24 miles and a 4000' elevation gain we reached Mike's Sky Ranch, a cozy little settlement that caters somewhat to the biking and Baja 1000 communities. The deal included individual rooms, a steak dinner, breakfast, hot water for showers and oil burning heaters in every room. There is no line electricity at Mike's so we had to wait for someone to fire off the generator to heat the water for our showers and power the lights in our rooms. At some seemingly random time, the generator was turned off and we were left for the night with kerosene hurricane lamps, oil heaters and heavy blankets. It was divine. I had somehow managed to acquire a local kitty to keep me company that night and he helped me enjoy one of the best night's sleep I had had in a long time. The morning was clear, and after a hearty breakfast, we packed up the bikes and headed back down the mountain. The road twisted some more, but we took an easier route back to Hwy 3 so it didn't take us nearly as long to get to Hwy 3 as it did to get to Mike's. We were soon on a paved road and on our way to San Felipe. The road was decent, flat and fast and passed though open flat country that didn't have much to offer to look at. It didn't take us long to reach San Felipe and find lunch. The winds were really blowing, something seasonal that the locals called "Northers" so we decided not to camp, but instead, to stay at a hotel in town. We ran into some other bikers, had dinner with them and enjoyed a relaxing time in town. The wind was still blowing when we left San Felipe the next morning, but the sky was clear. We headed south on paved roads, but they quickly deteriorated to some of the worst pavement I ever had the privilege of riding on. It wasn't just rough pavement � it was bombed out, missing stretches of gravel pavement. I pitied anyone who didn't have good suspension who tried to travel this stretch. The scenery wasn't that spectacular, which is just as well, as all of our concentration was needed to avoid the largest of the potholes and bike eaters. We were surprised when we reached the sleepy town of Puertocitos, as there was a sign that proclaimed: Rough Road Ahead. Then what were we just on? The "Rough Road" that we were warned of was actually easier to navigate, as it was pure packed dirt/gravel and had no potholes to avoid. By now the scenery had become more interesting visually, as it hugged the coast of the Gulf of California, presenting some dramatic coastal views of rocky shores and isolated sandy beaches. The views became even better as the road climbed and dipped along the coast, showing us interesting bays and islands. The gravel was tricky in some parts, that kept our speeds down somewhat (for some more than others). Eventually the mountains moved inland and we were left with some flat, dry stretches of landscape. The road became almost unbearable at this point, with a washboard surface that took its toll on both the bikes and the riders. Somewhere along this section of road is my license plate, discovered AWOL during our lunch at Punta Bufeo. I also discovered that my speedometer cable had broken. This cable was one of the few "spare parts" that I hadn't packed along with me. Oh well, who needs to know how fast you're going in Mexico, right? After lunch we continued southward along the east coast of Baja, through an arid and desolate landscape that didn't seem home to much of anything, humans included. In the middle of what appeared to be nowhere, we came upon a military checkpoint, populated with bored- and hot-looking soldiers. They noticed us, but took little interest, as we rode past them and continued to our night's destination: Alfonsia's at Gonzaga Bay. Here was a sheltered bay, complete with cabanas, a couple of fishing boats and a surprising population of American ex-patriots. After we unloaded the bikes we relaxed in our rooms, on the beach or around the restaurant area. Alfonsia's is a stretch of private homes along the beach with rooms for rent, a restaurant/bar area and a close-knit community. We quickly found out just how close and friendly these people were during dinner, for, unbeknownst to me, it was Christmas Eve. We were seated at a table when we learned that the community provides a potluck dinner every year for anyone who happens by. We were treated to turkey, mashed potatoes, fresh rolls, vegetables, and various tasty local dishes. Everyone was friendly and made us feel quite welcome. The Christmas tree in the corner (with homemade ornaments) seemed out of place earlier in this warm and dry climate, but it fit right in now with the generous people that we found that evening. It was the closest thing to family that I was going to get for Christmas this year. Christmas Day dawned the same as each previous day, with a glorious sunrise and blue skies. We got back on the road and continued south. The cactus appeared in great numbers, the road returned to the mountains and the surface became hard and fast. It was to be a good day. The pace picked up considerably along this stretch, and we barely slowed down while the road churned through the mountains before dropping down to a wide plain where there is a small cluster of buildings (two, actually) called Coco's Corner. It's an odd little place: very lonely but obviously visited frequently by passers-by. There are beer cans strung along fences everywhere, and eclectic found objects on display. The collection of donated underwear and various currencies is also quite impressive. Definitely a unique place, with very little to offer other than a diversion from the bleak landscape surrounding it. We left Coco's Corner and continued on a very flat and straight dirt road that lead us to Mexico's paved Hwy 1, where we ran into 3 of the guys we had dinner with the previous nigh in San Felipe. Our group of six also discussed our future options and plans. Half of the group wanted to hit more back roads, while the other half wanted to take advantage of the faster paced paved roads and see more of the country. We would split up here with the possibility of meeting up again later in the trip. Dave recommended a place in Mulege where we could meet and an approximate time to expect them. So after a brief farewell, Rob, Dave and Norm jumped on their KLRs and headed east towards wild and unknown territory while James, Mark and I continued along Hwy 1 and the tamer environs of San Ignacio and points beyond. Our smaller group of three continued on its way, having lunch with The Tamale Lady in Jesus Marias. We were stopped by the military at the border to Baja Sur. That was the first time we had to get off our bikes and show our papers. I had to unpack my bags to get to my papers, as I didn't really expect to need them again any time soon. The soldiers (complete with big guns and fancy camouflaged outfits) were nice though, and let us pass soon enough. At the next two checkpoints we were just waved through � you never know when you'll get stopped. After some very long and straight roads, we made our way into the heart of San Ignacio, home to one of the many colonial cathedrals that we would see during our trip. The town was very small, and didn't take long to ride around. Surprisingly enough, we met up with the same bikers that we had first met in San Felipe, but they were continuing south a little further, while we were planning on camping there for the night. We found a fairly quite little place to set up our tents, complete with date palms and lush foliage. Dinner was basic, being whatever we had in our bags that could be heated up over the camp stove and then James and I played cards while the three of us sat at a table and talked. Mark had made friends with the local dog "Bonbon" who was guarding our tents when we returned from the card games. It was still chilly that evening, so we crawled into our tents for a relatively early night. 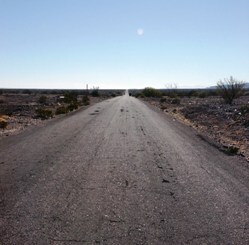 Photo: Pavement riding along Baja can mean long, straight stretches of roads sometimes. The next morning we went back to the "downtown" portion of San Ignacio and took some pictures and walked around for a little bit. We packed up camp and headed for breakfast in Santa Roselia. The ride was a really nice one. The road wound through some hills, the vegetation was greener and more prevalent and eventually we topped a ridge on our way back to the coast of the Gulf of California. We crested a fun mountain pass that then dropped us into a flat, desolate landscape on the vast shores of the Gulf. I was amazed at the number of burned out rusted vehicle hulks littering the landscape. Where did they come from, why were they there and why didn't anyone do anything about them? Santa Roselia was a bigger town than I expected, but we still had a hard time finding a place to eat. Nothing seemed to be open, or sold something other than food. After we did find lunch we spent some time at the local automotive store looking for some odds and ends for our bikes. The employees were very helpful and, of course, it's always interesting to try communicating with someone who doesn't speak your language. From Santa Roselia we continued down the coast for an uneventful 30 miles to Mulege, where we were to camp for the night at The Orchard, recommended by Dave. Mulege was another encampment of ex-pats, and had everything that we were looking for including laundry facilities and an Internet caf�. As we had agreed to wait for the rest of the group in Mulege, Mark, James and I were free to sleep in and take an easy day in town. We spent a quiet day around camp, checking out the locals' houses and seeing what the town had to offer. The wind had been blowing every day since we had started our trip, but yesterday it had died down and today it looked like it may warm up a bit. The sun finally climbed high enough to warm us up but all too soon clouds rolled in and obscured the sun, depriving us of the warmth. The Orchard is a very tidy and fairly good-sized campground, with hot showers and a short one-mile walk into town. We sighted our first frigate bird, a huge and prehistoric looking creature that soared effortlessly above the water. I also watched some pelicans dive into the river, searching for breakfast. Our group then dropped off our laundry, checked email and ate ice cream. It was a very relaxing and restful day. That evening we met Lois and Bob, ex-pats from Minnesota who own a really beautiful house at the edge of the campground and along the river. They invited us in and we spent a comfortable evening with them. I thought that the clouds would have moved off overnight but was disappointed to wake up to continued cloud cover. I was surprised when Rob, Dave and Norm showed up around ten o'clock that morning. In fact, I was rather surprised that they showed up at all, as there had been some talk as to different destinations on the mainland. As we finished strapping down our gear we agreed that we would indeed continue to split the group, with the three dirt riders heading over to the mainland via Santa Rosalia to visit Copper Canyon and my group of three continuing south to La Paz, where we'd cross over to Mazatlan. The three took off for the ferry back at Santa Roselia and we three headed south yet again. The road out of Mulege was fun, with high speed sweepers and tighter curves and decent pavement. The weather was heavily overcast and I was surprised that it didn't rain on us sooner than it did. The landscape was open, despite all of the curves carved into it. We had almost reached the coastal town of Loreto when it started to sprinkle on us. We took the opportunity to stop for lunch, watching our bikes get damp in the light drizzle. After lunch we headed back to the pavement and I was amazed at the beauty of the engineering of the road that we were on. It climbed dramatically through the mountains, giving us awesome views back to the Gulf and the winding road that we had just climbed up. The only way it could have been better was to have clearer weather and drier roads. As it was, I was very tentative when riding through these curves, as the trucks and buses had left a trail of oil and grease that made any sure-footedness a distant memory. The joys of climbing the mountain were soon left behind as we entered the central flatlands of Southern Baja and the road straightened out to the distant horizon. The speed limits in Mexico are ridiculously low, usually around 80kmp for a road that doesn't turn, has no traffic and no joining roads. Fortunately these speed limits are rarely enforced and we were still able to make good time. The rains didn't let up and we rode all the way to Ciudad Constitucion in the drizzle. It was along this stretch of road that I saw a most unusual sight. The flat plains were beginning to show signs of agriculture when I noticed a large field of corn backed by a row of palm trees. We're not in Kansas any more. Upon entering Ciudad Constitucion we found a charming hotel off the main drag, unloaded our bikes and took a long walk around town, eventually finding dinner.